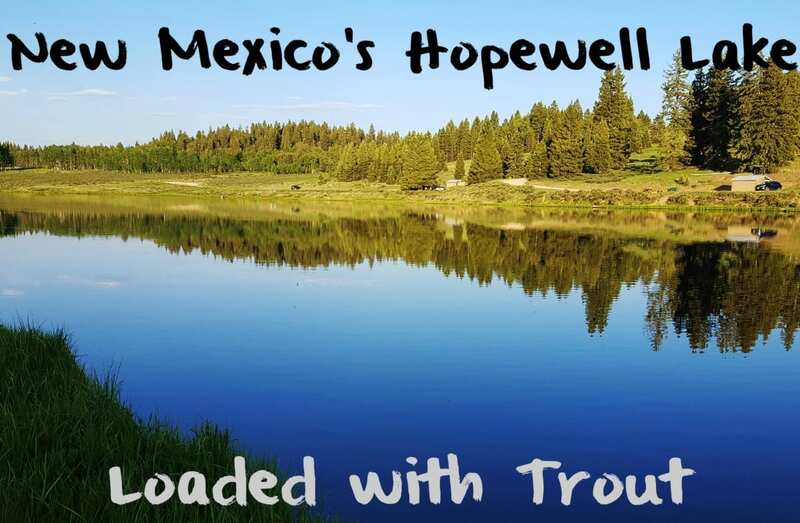 It’s been an interesting spring and summer at Northern New Mexico’s Hopewell Lake. The small, high mountain lake took longer than normal to shed its winter layer of ice. Anglers used to fishing the lake in late spring had to wait. Spring wildfires closed access to the area while firefighters dipped water from the lake to battle blazes, which put trout plants on hold. Fortunately, we’ve settled back in to the traditional summer pattern. The lake is flooded with trout and more are arriving often. There’s plenty of large trout in Hopewell. Meanwhile much of the biomass is made up of smaller eight and nine inch trout. New Mexico Game & Fish has stocked the lake several times this spring and summer and will continue to do so. Keep in mind they did stock a pile of 15-inch trout back in late June. On the other hand, anglers will have to sift through the smaller ones to tie into the larger ones. To be honest, most anglers don’t care how big the trout are. At 9,500 feet in the Carson National Forest this put-and-take fishery is heavily targeted by campers. The smaller trout fit perfectly in the skillet. There are small brook trout in the lake and some cutthroat, too, but most anglers catch rainbows, largely because they are the most heavily stocked species – by a lot. At 14 acres there’s no secret spot when it comes to fishing Hopewell. Sure anglers will tell you one spot fishes better than another. Nevertheless, when we filmed Pautzke Outdoors here trout were rising on nearly every inch of the small reservoir. We arrived at roughly 6:30 pm and were able to catch enough trout to film the show within an hour. Sure, we didn’t catch anything bigger than 10 inches, but we did release several dozen in that time. Early and late in the day always yields the best action for bait/spin anglers. We targeted the trout two ways. With a second rod stamp we drifted Silver Label and Chartreuse Garlic salmon eggs under a bobber and also floated Mountain Wildfire, Garlic Wildfire, Peach Garlic and Garlic Salmon Egg Fire Bait off the bottom. Both techniques worked excellent when placed on a Lazer Sharp size 12 salmon egg hook for the eggs and Eagle Claw size 10 egg hook for the Fire Bait. Our baits were getting hit almost instantly, even having six-pound test on a few of the lines. Personally, I’d recommend four-pound test or lighter. The water up here is clear enough though trout don’t tend to be too line shy. We fished directly in front of the parking area by the restrooms and the side opposite of the lake, but did notice those on the dam catching trout, too. We didn’t see a single brook trout caught. On the other hand, a fly angler told us he caught many six-inch brookies in the shallows on the side of the lake opposite of the dam. Pautzke Fire Bait and Silver Label/Chartreuse Garlic eggs are available in all New Mexico Walmart stores and at various tackle shops. For more information on fishing Hopewell Lake please the New Mexico Game & Fish http://www.wildlife.state.nm.us/fishing.